The House of Sequiade, the main building of the old Tin House Foreira, large property and of great importance since it was part of the Order of Malta. Its construction dates back to 1748. With nearly 250 years of history, its owners have moved forward with a draft reconstruction and refurbishment with the aim of becoming a reference of rental accommodation. It has been careful to keep the original trait, keeping the structures and materials typical of Minho housing, preserving the beauty and solidity of granite, which easily jump in sight of who it comes. 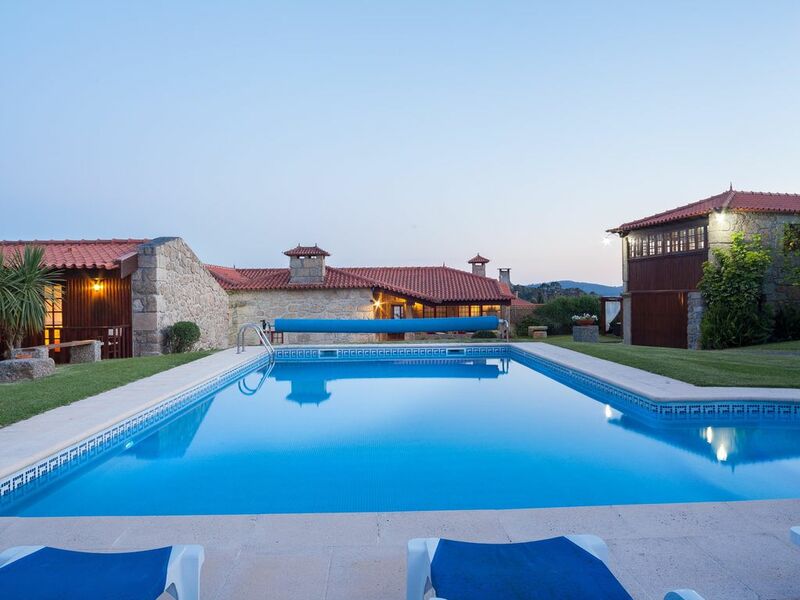 The house offers the opportunity to spend moments of rest with comfort and tranquility, and has therefore many outdoor spaces lawns, pergolas with flowers, swimming pool and garden beds where you can relax, read a book or simply breathe in the quiet of the countryside. There is also a games room, where you can entertain playing snooker or darts, listen to music and watch TV. The rooms of the house, belonging to the original building, are located in a separate floor has a living room with fireplace, and extremely comfortable. The apartments are more spacious and comprise a living room with small kitchen downstairs and a bedroom with balcony on the top floor. The Sequeade House offers comfort and quiet to spend relaxing moments with you care about. It is located in Rua da Piedade, 61, parish Sequeade, Barcelos county and awaits your visit with the promise of a quality service with friendliness and hospitality. I am a kindergarten teacher, wife and mother of 3 children. I like to open my home to receive people, it was one of the reasons that led me to build a holiday home in the countryside. Sympathy and professionalism are assets that I use to receive guests, so that they feel comfortable and in a familiar atmosphere. In your stay in Casa de Sequiade, you'll enjoy all the tranquility of the countryside with all the confort and hospitality. Meals can be served to groups of 10 to 20 people. Please contact us for menus and prices. An exterior kitchen is also provided (with free access), where the house guests can prepare their meals. Charm in a grand garden. The total setting, innside-outside is a perfect get together place for up to 16 people. The combination of stone and dark wood, tails and private furnitures. The owner gives you a spacious private home with tons of Portuguese charm. We where four families with children, all related and loved every minute of a fantastic week. Everywhere you look, close or far, it is all beautiful landscape or charming houses. The pool is good for a long swim and dives. The outdoor barbecue kitchen ads to the evening ambiance. Nice beds, clean and beautiful bathrooms in all seven quarters. Very nice house, with everything you need at your fingertips! Great swimming pool and beautiful surroundings. The house has a nice playing area as well, with a basketball hoop, table tennis, pool table and digital darts board. Porto airport is at 45 minutes distance and Braga can be reached in about half an hour. We recommend this house for 100%! It is in these opinions that we recognize the work and dedication that we give to our house. Acceuil très agréable et disponibilité des propriétaires. La villa est très bien entretenue et tout y est! On ne manque de rien que ce soit a l'intérieur ou à l'extérieur (nombreux jeux mis à disposition, piscine...). Nous avons été enchantés de notre séjour et nous serions ravis d'y revenir! Nous étions très heureux de vous recevoir, nous avons pris soin de notre maison. Acceuil formidable et villa à la hauteur de nos attentes. tout est vraiment bien pensé. Les chambres sont très belles, bien entretenues et spacieuses. Que dire pour les occupations annexes , elles sont vraiment superbes et il y en a pour tout le monde. un séjour, à l''occasion du mariage de notre fils idéal." Take the A3 motorway and exit at exit 9 in MARTIM / CABREIROS. After the toll, turn left along the EN 103 towards Braga. After 900 m turn right on Passos de S.Julião. After 5.5 km you will find a gas station where you turn right. 400 m later, you will find the "Casa de Sequiade" on your left. There's a traditional food restaurant 3.5 km from the house. But you can choose to taste a bit of the local cuisine at the "Casa de Sequiade". Please contact us to know the less and price.